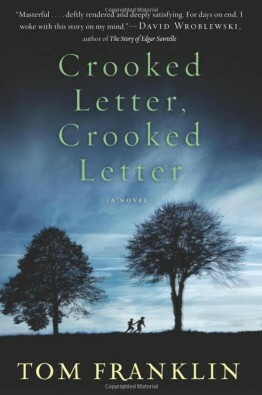 I received Crooked Letter, Crooked Letter as a Christmas gift from my son, who is also an author. I knew it was going to be good, but how good? Whereas so many novels in mainstream suspense forego character development for plot, this novel does not. Those of you who have read my books know I love tight interweaving of character and plot. Tom Franklin has created three-dimensional characters with flaws and foibles that slide under your skin. They make you look at yourself with the same unflinching eye he uses to view his characters. This novel has a strong and true sense of place. I quite often use small Southern towns as settings for my books, utilizing them as characters unto themselves. Franklin does this with a superb hand. He also delves deeply into the twisted mineshafts of family relationships in a way that seems both realistic and heart wrenching. His use of dialog makes this book hum along with readers happily in tow. Crooked Letter, Crooked Letter tells the story of two boyhood friends, Larry Ott, the only child of middle-class parents, and Silas Jones, son of a single black mother. Their teenaged friendship is short-lived, and yet colors the rest of their lives. As teens, they are torn apart by circumstance, only to be brought together again years later by a terrible crime in a rural Mississippi town. The interweaving of past and present, the slow revelation of old secrets and an resolute look at human frailty all make this book a must read.